Check out the latest Myer Catalogue, read the reviews on new deals. 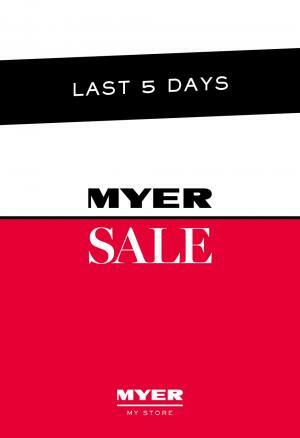 Myer sales can offer great deals on the product range of all categories that the brand offers. Clothing trends, seasonal fashions, new deals on home appliances and toy sales are possible categories in the Myer Catalogues. The online sales can also be about Christmas and similar festive days. Find Fathers and Mothers day gifts, Valentine’s day specials, and much more in these catalogues. Moreover, you can follow our Facebook page to get notifications or allow your browser to notify you whenever an update is posted here. Browse the Myer Catalogue that contains a couple of deals, special prices, and great discounts from the Easter toy sale. 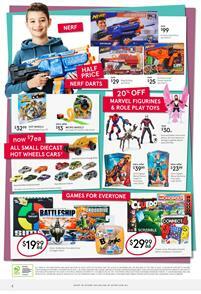 This toy book of Myer can offer you half-price deals on Nerf darts. Save 20% off Marvel toys. Spider-Man deluxe figure will now cost $30. I am excited for the Avengers Endgame like everyone who is a Marvel fan. Considering the hype and excitement before the upcoming movie having some figures of our favourite characters like Spider-Man or Ant-Man can be fun. Decorate your working desk with your favorite character from other worlds, too. For example, everybody loves LEGOs no matter how old you are. LEGO Creator is a James Bond Aston Martin DB5 Car on pg 4 of this catalogue. Check out its price which is lower now. The deals are effective until 28 April. LEGO City, Creator, LEGO Movie 2 sets are in the final page of the Myer Catalogue Easter toy sale. Remember that Barbie is celebrating its 60th year with special products and great discounts. Myer also lowers the price of Dreamhouse, 60th-year-anniversary dolls, and more on that page. You have really good options from men's clothing collection of the latest Myer Catalogue. Find classic, cosy, and premium quality knitwear for men. Blaq merino knits are only available at Myer and they are $69 each. Autumn trends of jackets are present in the same part of the catalogue. Buy Jack & Jones jackets and coats at Myer for cheaper prices. Kenji style bomber jacket is now $69. Jean is $39 and sweat top will cost $39! Autumn is a time to look better since you can cover yourself with more clothing. Sweats are very popular products to wear in Autumn and Winter. Maddox Henleys are exclusive to Myer and it'll cost $29! And shoes are very important to complete your style. You will find the classical design of lace-up shoes like Blaq for only $89 at Myer. Browse a wide range of jeans on pg 11. Save on your formal wear shirts, jackets, pants. Buy Pierre Cardin suit, Blaq shirts and more. Businesswear is one of the best sales from the men's clothing section. You can also find electronics, TVs, electronic shavers, irons, tableware, cookware, quilt cover, espresso machines in the latest Myer Catalogue. Follow the Facebook page to get posts on your feed and subscribe to get emails. This is a new sale by Myer Catalogue which has a great content of women's clothing. The products of Levi's, tees, hoodies, dresses, flat shoes, boots, Autumn fashion are the elements to find in this part of the Myer Catalogue. Feel comfortable, look stylish, and buy quality things with Myer's new prices. Save with the discounts of Revlon cosmetics, makeup products, and similar sort of beauty products as well. In this one, you will also be able to buy kids' products like pyjama sets, jacket, sleepwear, sleeve tees, and more products. Men's clothing products are knitwear, sweats, jackets, lace-ups and classic shoes on pg 10-11. You can find a fantastic blazer shirt in the same part of the catalogue. Buy Calvin Klein Jeans of men for only $89 this week at Myer. Electrical personal care products, home appliances, cookware, quilt covers from bedroom section, and more. Follow the Facebook page to see them in your feed. Future catalogues will be in your inbox when you subscribe to the newsletter. You can easily find other categories in the Myer Catalogue page. Myer Catalogue is not only for savings. It gives a lot of ideas on how to decorate your bedroom. Quilt cover, throws, cushion, even plants are a part of bedroom decoration with Myer Catalogue this week. The deals are effective until 17 Mar 2019. Check out 30% discount on cushions on pg 2-3. Burgundy, florals, Sheridan, and more styles appear on these pages. All sleeping types need a specific type of pillow. Foam, surround, firm feel, and more pillows are available within the new range of Myer. Anti-allergy pillows are also available products of this sale. Browse these on pg 8. These are just example deals from the catalogue. Check out the catalogue preview for all the bedroom styles and products. Servingware is another major sale in the catalogue. Oblong bowls, round bowls, dinner sets, Jamie Oliver by Tefal cookware, knife block set, and many more are available in the new range. Follow our Facebook page for more deals. Subscribe to Myer Catalogue to get emails about the future catalogues. Dresses are amazing deals from the latest Myer Catalogue. You can find wrap dress, shirt dress, jersey dress, and more are available in the variety of products on pg 2-3. There is also a great discount on these items. Find more casual clothing for ladies on pg 4-5. Swimwear is a need in summer and you can find some quality products starting at $49. Enjoy the nature of Australia and live a better version of your life in the new year. I wish you a rich and peaceful 2019 full of savings. Our favourite brands are available on this part of the catalogue. Levi's, Tommy Hilfiger, Calvin Klein, Basque, and more brands are the featured items. Check out underwear sale that is aclearance also. Save up 50% on women's lingerie, sleepwear, hosiery, and socks. I am sure you can find something that suits with your taste on pg 7, too. Sandals, watches, sunglasses, accessories are also on sale. Save 50% on sunglasses, 25% on jewellery, and 20% on watches. Follow our Facebook page for more deals, future catalogues and more. You can track all discounts from the Myer online sales particularly the ones of the catalogues.